Following on from yesterday, I have now made it to the Whitworth Gallery ready to view the Petherbridge Exhibition I meet up in the cafe with about a dozen fellow students and the group leader Bryan. Bryan knows a whole lot of stuff about art and you have to do your best listening when he speaks. We discussed the fact of what happens to the failures that don’t work in such an exacting medium as pen and ink and how much of an edit the artist must have in such a situation. I like the idea that Petherbridge has more than an idea of where the drawing was going to go or get to but allowed the work to grow as it spoke to her, with a good dialogue her failures must be few. The drawing I liked the best was Taming the bay (Melbourne) probably because it had a more human feel to it, maybe because the sepia ink had run in places but even then I suspect Petherbridge had engineered this for effect, just as she had done in the water in the Fourteen Stations of the Tiber series. 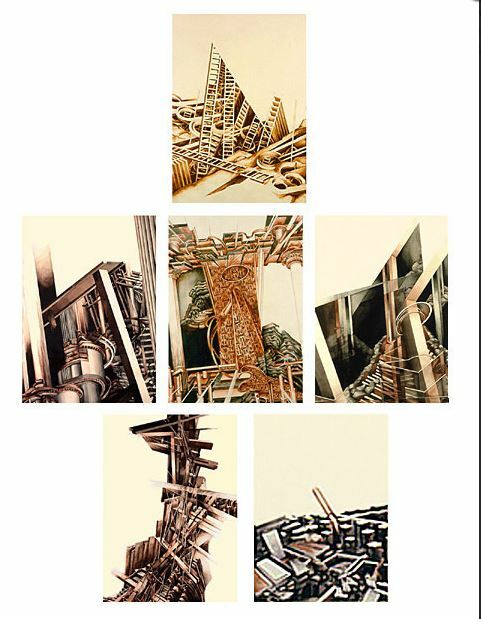 My runner up was the drawings from the Altarpiece of 1984; I found their warm sepia tones more relaxing than the stark black and white drawings “in technical pens that belong to the aesthetic of construction and engineering”,(Malbert, 2016: 84) and maybe because I encounter these technical engineering drawings in my work daily I see them less as art. One of the things that is surprising is that Petherbridge does not use any of her own drawings in her seminal work The Primacy of Drawing where she is able to write most eloquently of the drawings and processes of others, I have seen her speak of her own drawing in the video of the Battle of Homs and she writes of her own drawings in the catalogue and ends with this “My own drawings are, I think, about the impossibility of drawing landscape and also about attachment to and social critique of place. Drawing is so close to writing; I believe that I draw/write both my dissatisfactions and my aspirations in pen and ink” (Malbert, 2016:85) I think this is a suitable and fitting summation of her lifetimes work. 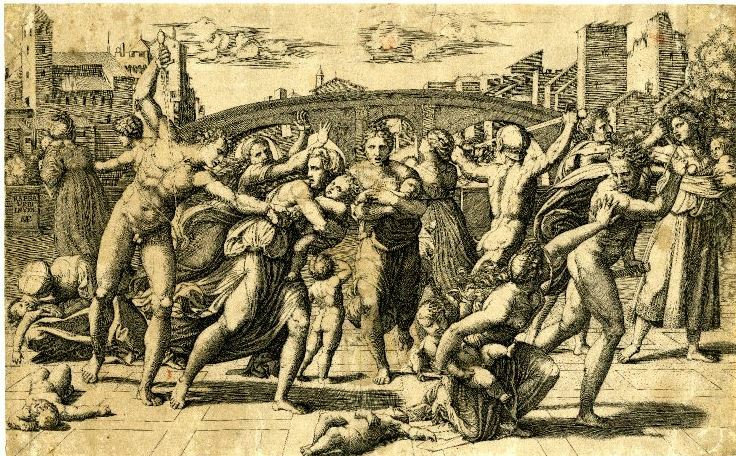 There is a great similarity between the appearance of an ink drawing and an etching, upstairs in the museum an exhibition of the work of Marcantonio Raimondi echoed this similarity. 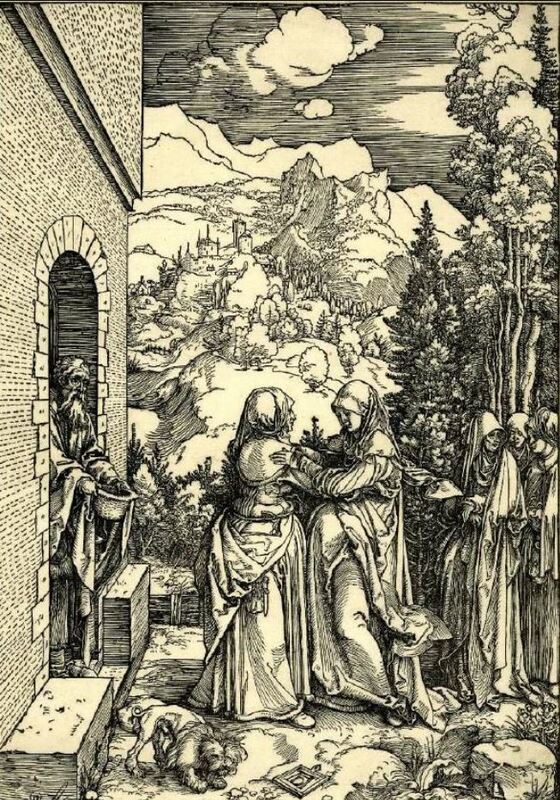 Marcantonio as he is better known collaborated with Raphael who designed patterns for Marcantonio to etch. 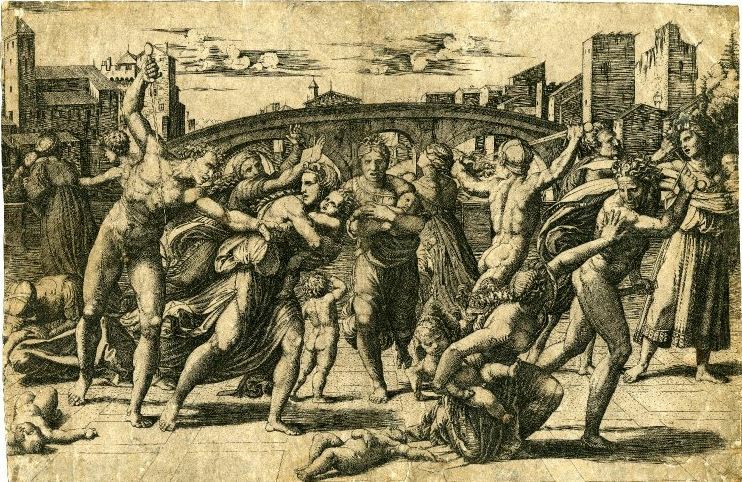 Perhaps the most celebrated being The Massacre of the Innocents which gives a marvellous insight into both Marcantonio’s and Raphael’s processes. 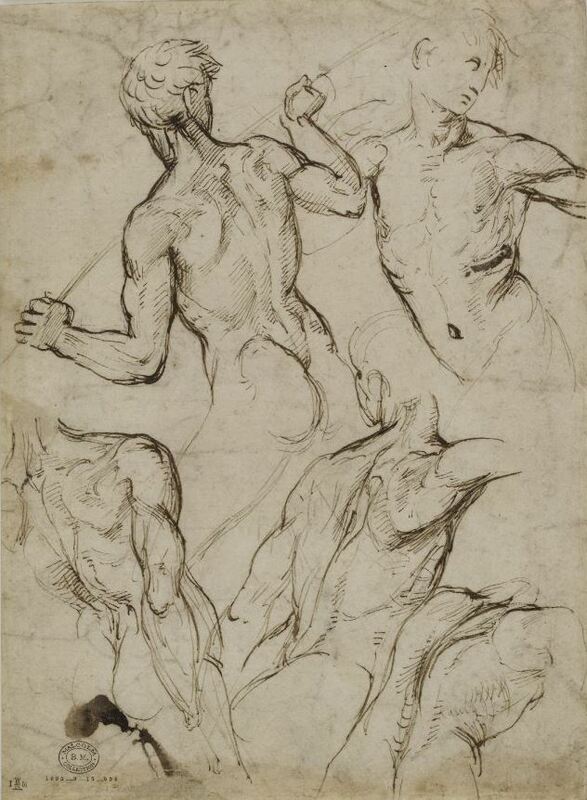 The cycle start starts with the sketch at figure 2 and is followed by a fairly crude pen and ink sketch both by Raphael, of which I haven’t been able to find a copy on the internet, that was pricked through and ponced with charcoal by Raphael to allow him to create the drawings at figures 3 and 4. 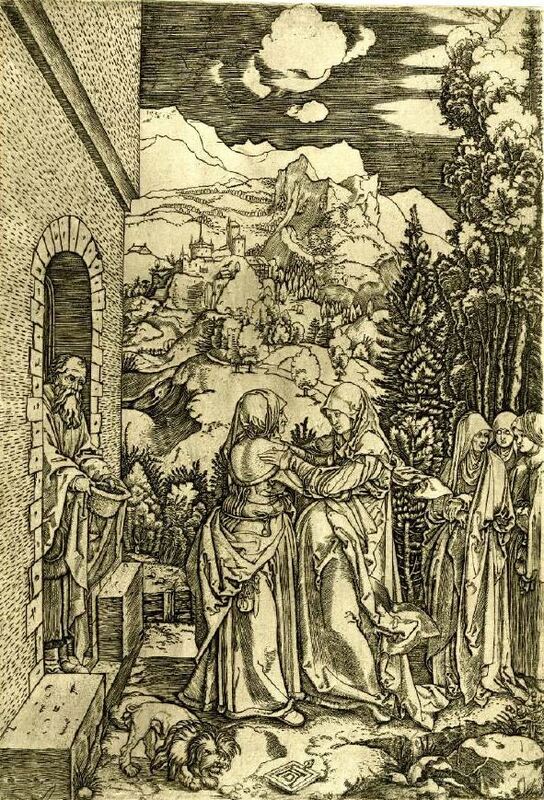 The drawing at figure 4 is (my guess) pricked and ponced by Marcantonio to create the etching of the same piece at figures 5 and 6. 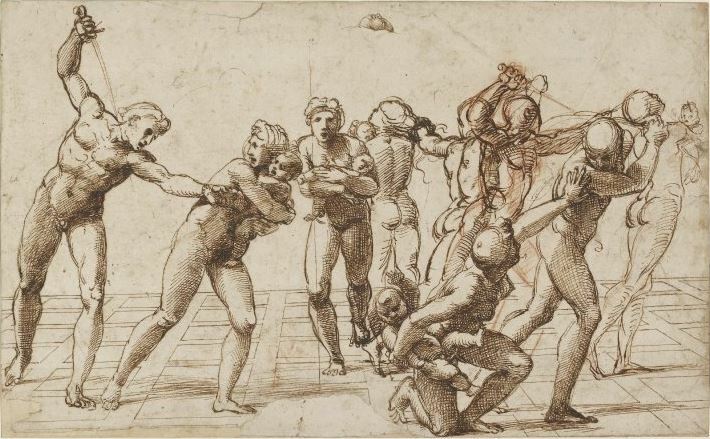 Prior to this I had always thought that Raphael had walked the same high wire as Petherbridge letting the drawing speak to him as he drew and I was amazed to discover this side to his process maybe there is hope yet for me and my tracing paper and Photoshop. 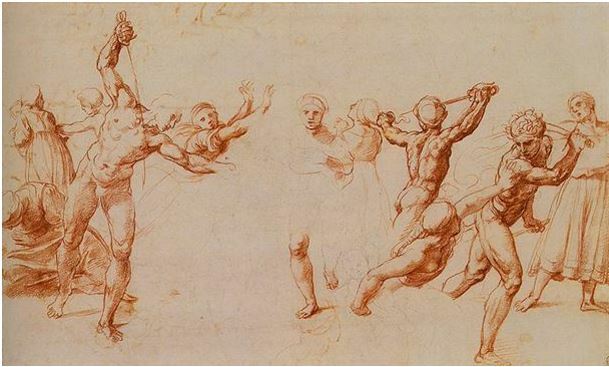 What is possibly more amazing is that Marcantonio possibly pricked and ponced a Raphael as part of his process. There is a definite lesson in here to be less precocious with your sketches, when only yesterday I started giving mine names. On my way back to the gallery cafe I visited the video installation Vertigo Sea, more echo’s of Petherbridge, by John Akomfrah. I was all right when they shot the deer because I have seen that before with you in Bambi but I felt it was a bit much when they started shooting polar bears and I had to leave. The whole afternoon was curiously summed up by Deanna Petherbridge in The Primacy of drawing where she notes “Raphael and Durer famously interchanged drawings about 1515…..The Raphael Durer reciprocity is an acknowledgement of admiration and equal status,” (Petherbridge 2010: 76) when Durer was probably made aware of Raphael’s work through the etchings of Marcantonio. The serious work having been done, I retired to the Turing Arms for a well deserved pint of lager where I caught up with your Aunty Loz before venturing with her to Greens Vegetarian Restaurant in Didsbury where I was pleased to eat the best food I have eaten in a decade even though, as you know and are often want to scold me, I am not a vegetarian. Apologies my dear for some of the big words in this post but it will do your English good to look them up in your dictionary, please don’t use the internet, so you can be more prepared for the day the electricity goes down, and I hope you enjoyed playing spot the difference between the various renaissance prints and drawings. Malbert R. (2016) Deanna Petherbridge Drawing and Dialogue. 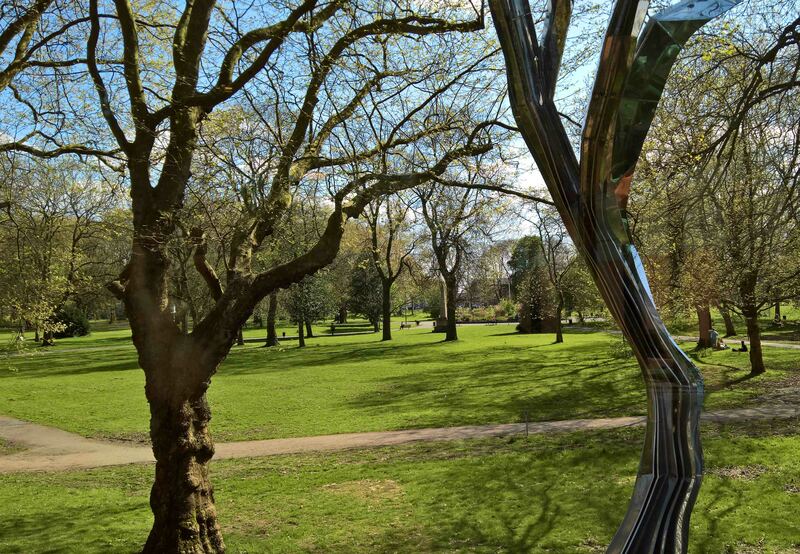 Manchester: The Whitworth Gallery.